Preston-next-Faversham, to give it its full name, which distinguishes it from Preston-next-Wingham, east of Canterbury, is an ancient parish whose original boundaries, valid till the late 19th century, meant that it adjoined the parish and borough of Faversham both on the south and the north-west (see the Parish Boundaries Map). North-west of Faversham, there was a large detached part of the parish ('North Preston') on the west bank of Faversham Creek, opposite the town, and extending nearly as far as Holly Shore (which was in a detached portion of the parish of Luddenham). This also included Brent Hill, overlooking Stonebridge Pond in Faversham, some of Priory Row (close to Davington Church), Ham Farm and much of the Marsh Gunpowder Works. The main part of the parish included the parish church of St Catherine, a slice of the built-up area of the town south of Solomon's Lane, and Copton, the principal manor house. South-west of this was another sizeable detached chunk. The Brents, in the detached northern part, was built up as Faversham's first Industrial Revolution suburb in the early 19th century and became a separate ecclesiastical parish in 1881. In 1933 this was united with the ecclesiastical parish of Davington. The area behind The Brents, where much housing development took place in the 1950s and 1960s, is still known as North Preston. 20th-century civil boundary changes brought the whole of the northern part of Preston, and much of the main part, of the ancient parish within the Borough (now Town) of Faversham. Some of the main part, including Copton, was transferred to the civil parish of Sheldwich, adjacent to the south. However the ecclesiastical boundaries of the main part of the parish remain much as they have always been, and now include much recent housing development north of the A2. Family historians in particular need to be aware of these complex changes. They mean that before the late 19th century most people living (for example) on The Brents, in Brent Hill and at Ham Farm would have been baptised and buried at Preston - not Faversham or Davington - Church. Today the small settlement alongside the A2 around The Windmill pub is generally regarded as ‘Preston Village'. However none of the existing buildings is older than the 18th century and it is thought that the small settlement at the south end of Preston Street, in Faversham's built-up area, was the actual village nucleus. Though they have now been displaced, there were 16th-century houses here. In this case Preston Street, as the village street, would have been the counterpart of (for example) Boughton Street in Boughton and Ospringe Street in Ospringe. Preston was originally known by the name of its principal manor house, Coppanstan, later abbreviated to Copton. After the manor came into the hands of the Archbishop of Canterbury in the early 9th century it became known as Preostantun, ‘the priest's settlement', later abbreviated to Preston. Because in England there are at least 34 other settlements with the same name, many are double-barrelled to make distinction easier, Preston Capes, Preston Gubbals and Preston Wynne, for example. The main part of the parish lies on brickearth overlying chalk. This fertile, easily-worked soil, and the dry, warm climate attracted early settlers. By late Iron Age times there was a small settlement a few hundred yards south of Macknade, between the present A2 and M2. The A2 - the high-class highway originally built by the Romans in the 1st century to link their ports at Dover and Richborough with London - doubtless brought new prosperity. In the Middle Ages it would also have brought villagers within sight of the many crowned heads and princes who used this route - not to mention the Canterbury Pilgrims who also did so. The principal crops were fruit and grain. A parish church dedicated to St Catherine was built probably in Saxon times. Like many others in Kent it was not sited where you might expect it to be - along a main highway. But unlike most others, neither was it sited close to the principal manor house. It was built about halfway along the important route from the main manor house, Copton, to Faversham Parish Church. Since it stands close to Faversham railway station, it is often mistaken for Faversham Church by passing passengers. For a detailed account of the present building, part-medieval and part-19th-century. In the detached portion of the ancient parish NW of the town of Faversham, the terrain slopes gently down from a fertile gravel ridge to marshlands fit only for pasture. The main manor of Copton (perhaps ‘the settlement at the head of the valley'), included Ham Farm, near Holly Shore, and is unusual because throughout its history it remained in ecclesiastical ownership, belonging finally to the Dean and Chapter of Canterbury. They and their predecessors, Christ Church monastery, were responsible for the upkeep of the chancel of the parish church - which is why it is of such high architectural quality. Oldest in the parish, the manor house is unusual in being flint-built rather than timber-framed. It goes back to the 14th century or earlier, though thanks to later alterations and additions its west wing, visible from the Ashford Road, looks Georgian. A listed building, it has an unusual early scissors-brace roof. It is thought that King Stephen's wife Matilda may have stayed here to monitor construction of the new Abbey she and he founded at Faversham in 1148. Other Preston manor houses are Macknade, near the corner of the A2 and the Selling Road, Perry Court, near the Abbey School, and Westwood, between the Ashford and Selling Roads, just south of the M2. Macknade, a listed manor house now occupied by Read's, a Michelin-starred restaurant with rooms, is a handsome Georgian house resting on earlier foundations. First recorded in Domesday Book in 1086, its etymology is elusive. The name of Perry Court, also first recorded in Domesday Book in 1086, recalls that it was once renowned for its pear orchards. The medieval manor house, probably as old as Copton, was displaced by a new building in the 1850s. The manor came to be owned by Dorothy, Lady Capel, who when she died in 1721 left money for the establishment and maintenance of 12 charity schools in different places with which she was associated. Her Trust still exists but the number of schools which benefit from it has dwindled. The St Mary of Charity Primary School in Orchard Place, Faversham, still does. The name of Westwood, first recorded in 699, is the oldest surviving one in the Faversham area. Presumably it was given this name because it was west of The Blean, the great forest which skirted Canterbury for about 6 miles on the north, and much of which still exists as the English equivalent of Antipodean ‘bush' - woodland basically undisturbed by man for millennia. Among owners was Sir Edward Poynings, whose notorious ‘Poynings' Law' (1494) made the Irish Parliament subject to the English one. The present house is mainly late 18th-century, and listed. 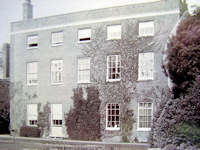 Never the seat of a manor, but prominent, was Preston House, in Preston Grove near the parish church - a big, austere late Georgian house built on the site of an earlier medieval building. It was demolished c 1930 and new houses in the then-popular Tudoresque taste erected on part of its site. The earlier building had been the home of several members of the Boyle family, including Richard Boyle, Earl of Cork, who in 1629 installed a fine monument in memory of his father in the parish church. Listed buildings in the main part of the ancient parish include the handsome Georgian Vicarage in Preston Lane and Grove House, also Georgian, nearby in Preston Grove. On The Brents, in the detached part NW of Faversham, are three early 19th-century buildings - Bridge House, the former Willow Tap pub, and the imposing Brents Tavern. Among properties listed in North Preston, also in this detached part, are Ravenscourt, a 16th-century farmhouse taking its name from the Raven family; Hillside and The Lawn, adjacent Georgian houses; and Davington Manor, also mainly Georgian and never in Davington or a manor house! In the late 19th century it was contrived out of two redundant gunpowder factory buildings. With the development of The Brents in the early 19th century and extension southwards of Faversham's built-up area in the mid 19th century, Preston's population grew from a modest 220 in 1801 to 1,535 in 1871. Though the ecclesiastical parish later ‘lost' The Brents and North Preston, 20th-century residential development south of the A2 has more than made up for this and the present population is estimated at 3,500. Industry developed rapidly from the late 18th century, with the Marsh Gunpowder Works opening in North Preston in 1786, brickmaking on a vast scale being undertaken behind The Brents in the 19th century, and a tile-works and agricultural engineering business opening on the east side of The Mall (which links Preston Street with the A2), also in the 19th century. Chalk pits were opened a large one on the N side of the A2 near ‘Preston Village' being known as Preston Limeworks. Overlooking the ‘Village' itself, in Salters Lane, near the A2, was Preston Windmill, with an auxiliary steam engine to grind grain when the wind slackened. The arrival of the railway in 1858, with Faversham Station and its associated engine sheds being in the parish, generated new employment. Pollock's shipyard opened at the N end of The Brents in 1916. In 1934, after the Marsh Gunpowder Works closed, its site became an aggregates quarry, still in use today. De-industrialisation started in the early 20th century, when the brickfields were worked out. 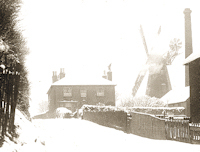 The windmill ceased operation in 1914 and was demolished in 1943. 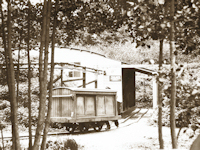 Mid-century, the Limeworks closed. The shipyard closed in 1975, and the engineering business in The Mall became a builders' merchants. At the end of the century farm outbuildings at Macknade were converted into a large independent food store. Between 1950 and the present day much residential redevelopment has taken place on the ‘brownfield' sites of the brickfields, the shipyard and the limeworks. North of the A2 and on The Brents and at North Preston the parish is now a predominantly residential suburb of Faversham. South of the A2, and at Ham, farming continues.